A Japanese soldier on Guadalcanal wrote a poignant letter days before his life ended. On December 1, 1942, Lance Corporal Kiyoshi Koto wrote his last letter home. By that time, his unit’s command structure was decimated and the battle strength of his army and its supporting navy was ravaged. As he wrote, the characters on the page of Koto’s letter took shape weakly because he had been wounded in the right arm by a shell during an attack five days earlier. He struggled to carry his rifle because of his injury, and he had not eaten because critical supplies had not reached the beach, let alone the front, on the embattled island where he had fought for days. Koto understood very well that he was a dead man. Koto’s unit of the 16th Japanese Infantry Regiment was situated west of the Matanikau River and across from the 164th Infantry Regiment of the U.S Army’s Americal Division (23rd Infantry Division), on the island the Japanese called Gadarukanaru and the Americans knew as Guadalcanal. U.S. Marines who came ashore on Guadalcanal almost four months earlier had been unopposed in spite of Japanese defense theory that prescribed a fierce, overwhelming reception for enemy landings at the shore. But the size of the island Koto’s unit and his comrades occupied was too great for defense of its many miles of shoreline. And most critically for the balance of the Pacific War, the Japanese had reached a logistical tipping point: success after far-flung success had stretched supply lines too thinly for adequate support of Japan’s distant conquests. Lance Corporal Koto and his countrymen were at the precise place and time that the strain became too great. Koto wrote, “Every day there is bombing by enemy airplanes, naval gunfire and artillery fire. No sign of friendly planes or of our navy appears. The transports haven’t come yet either. I have not eaten properly since the 24th of November; many days I have had nothing to eat at all. From tonight on indefinitely, again without expecting to return alive, I am going out resolutely to the front line. Even though I am holding my rifle with a right arm that doesn’t move easily, now is the time for me to dominate a military contest. I must serve as long as I can move at all. Three months earlier, an injured, hungry soldier like Kiyoshi Koto, with no hope of victory, no authority to retreat, and no expectation of relief, may have seemed to the Americans opposing him to be a reasonable candidate for surrender. But as the fight for Guadalcanal unfolded, American forces witnessed what would be the first of many subsequent encounters with Japanese units committed to die to the last man, however hopeless the outcome of the fight. This shocking event, known today as the Battle of the Tenaru River (actually fought at the Ilu River), closed the first Japanese effort to counterattack the Marines holding Henderson Field at Guadalcanal, the vital airstrip that allowed American planes to operate in support of the ground troops. It established a pattern for the war, a pattern with cultural roots deep in the Bushido code. Japanese construction of an airfield on Guadalcanal began in early July 1942, and American planners quickly realized the threat that such an airfield presented. From Guadalcanal, Japanese bombers could attack shipping between the United States and Australia. When American forces began moving toward Guadalcanal in mid-July, their Japanese counterparts were aware of a large convoy leaving San Francisco, but they concluded that the United States was reinforcing Australia or possibly sending support to Port Moresby on the island of New Guinea. commanded the ill-fated unit to which Corporal Kiyoshi Koto belonged during the fight for Guadalcanal. This mistaken analysis might have been overcome on the eve of the American invasion had it not been for bad weather. The anxious Marines gripping their rifles aboard landing craft on August 7, 1942, may have never reached the beach if the two previous days’ weather had been clear and one of the four Japanese patrol planes that fanned out from Florida Island each day had spotted their transports. Fortunately for the Marines, the previous couple of days had been stormy around Guadalcanal. Severe weather and thick clouds shielded the American ships as they approached. When the Marines landed, the unarmed Japanese construction crews working on the airfield nearby and their small guard detachment were already gone, having fled in terror when American warships opened up on their positions and American aircraft swooped in for bombing runs. The Japanese left behind not only their hot breakfasts, but also valuable equipment including road rollers, two gas locomotives on rails, a fleet of Chevrolet trucks, generators, thousands of gallons of gas and oil, a gas-powered winch, dozens of hand tools, and food supplies including canned Alaskan king crab and, to the delight of the Marines, a refrigeration unit and hundreds of cases of beer. The Marines established a perimeter, landed and dispersed supplies, and set about finishing the airfield with the captured Japanese construction equipment. Meanwhile, the Japanese 17th Army was ordered to retake Guadalcanal with naval support from the Combined Fleet. The units available to Lt. Gen. Harukichi Hyakutake, commander of the 17th, included the 28th Infantry Regiment under Colonel Kiyonao Ichiki. Ichiki’s regiment was closest, near Guam and already aboard transports that would have landed the unit at Midway had the effort to seize that atoll proceeded as the Japanese intended. 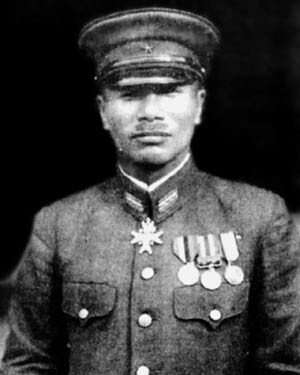 Ichiki’s regiment would reach Guadalcanal in two echelons five days apart, but Ichiki confidently planned to attack the Americans with his first echelon alone. He was grateful for the assignment because it was a chance to achieve the glory that had been denied his regiment when the Midway landings were aborted. Seven months of victory after victory over American and British forces had infused the Japanese with a sense of invincibility. They had supreme confidence in themselves and an equal disdain for American fighting will and skill. This mind-set, as yet unfazed by the navy’s setback in the epic Battle of Midway, together with the Japanese high command’s gross underestimation of the size of the American forces at Guadalcanal, predisposed Ichiki to take dramatic missteps. He determined to attack with half his force before he was landed ashore and able to make an objective assessment of American strength. A company of Ichiki’s command rushed across the sandbar at the mouth of the river, and Marine rifles, machine guns, and a 37mm gun responded with a hail of fire that decimated the first Japanese thrust. A few Japanese soldiers reached the American-held west side of the sandbar, forced their way through a barbed wire barrier, and died in hand-to-hand combat with Marines. Ichiki sent two more companies forward but failed to pierce the American line. Ichiki brought forward his machine-gun company with eight guns along with a pair of 70mm guns, but American artillery began answering the Marines’ call for support. Under the barrage, Ichiki withdrew most of his remaining troops behind the line of battle while a company of Japanese soldiers went into the ocean beyond the sandbar in an effort to flank the American line. 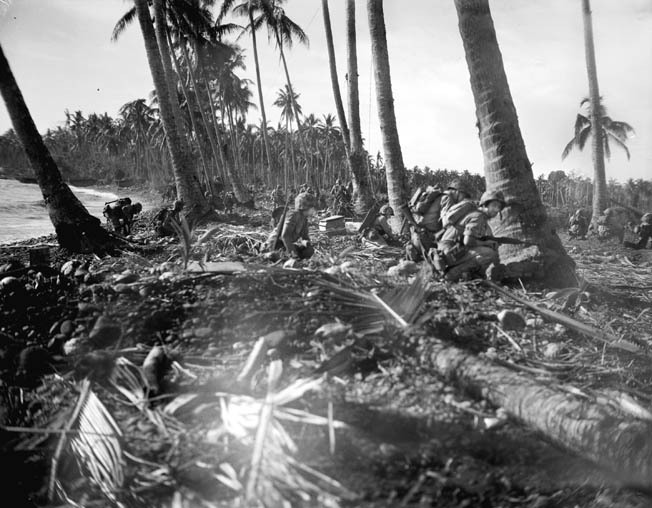 These troops were cut down in the surf by American machine-gun and artillery fire. U.S. Marines take up defensive positions along the shoreline at Guadalcanal. Early in the battle for control of the island, the Japanese came to grief when assaulting well-defended Marine lodgments. Daylight brought no further movement by Ichiki, but the Marines seized an opportunity to press the attack and wipe out Ichiki’s remaining force. A battalion moved south and crossed the dry bed of Alligator Creek (as the river was known by the Marines) inland and placed one company on Ichiki’s left to block an escape along the creek, sent another company toward the beach to block retreat along the coast, and attacked Ichiki’s now surrounded men with two companies from the rear. Ichiki’s force was trapped in a shrinking perimeter with increasingly intense American fire supported by strafing runs by excited Grumman F4F Wildcat fighter pilots who had reached Henderson Field only the day before and were seeing their first action. American light tanks crossed the sandbar to flank the Japanese then turned inland and raked the coconut grove where Ichiki’s surviving soldiers desperately fought on, the tanks crushing trees and routing Japanese soldiers in their path. When the tanks returned to their own line and the Marines allowed themselves to believe, for the moment, that the fighting was over, leaderless Japanese soldiers resumed firing on approaching Americans. Some tried to escape to the sea, where they were killed on the beach or shot by Marine riflemen as they swam away. Victorious Marines finally approached the scene of the firefight. Some hoped to find souvenirs like small arms, helmets, or most prized of all, the small national flags called hinomaru yosegaki, signed by family with well wishes and calls for victory, carried by some Japanese in their packs or worn around their waists for good luck. Other Marines simply scanned the scene of the carnage, fascinated by what they had accomplished. Meanwhile, corpsmen with their medical kits searched among the Japanese wounded whose lives they might be able to save. But the battle was not over for some. A few of the Japanese soldiers who were still alive begged for help, then shot Americans as they responded to their cries. Dying men detonated grenades when Americans approached. One wounded Japanese soldier suddenly fired his handgun at a group of American officers, missed, and then fatally shot himself in the head. Motivated by this refusal of the defeated Japanese to quit the fight, Marines backed away, formed a line at the creek bank, raised their rifles, and fired away at the prostrate enemy soldiers, most of whom were already dead. The Marines lost 34 men. Japanese dead numbered nearly 800, including Ichiki. The Americans captured hundreds of Japanese rifles and 30 machine guns, as well as grenade launchers and light weapons, but of most immediate benefit were captured Japanese shovels. The scale of the fight was not great in comparison to others during World War II in the Pacific or in the annals of military history, and it was only the first of many actions on land and in the waters off Guadalcanal’s coast that would ultimately decide the outcome of the battle for the Solomon Islands. 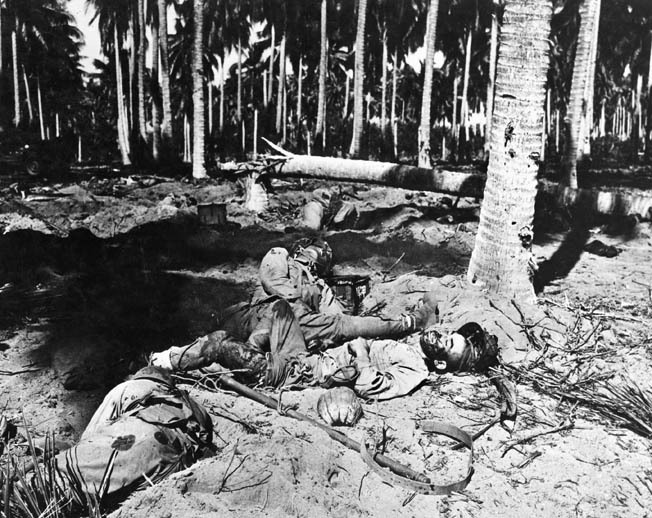 Dead Japanese soldiers lie half buried in the sand near the mouth of the Ilu River after a vicious fight with U.S. Marines on Guadalcanal that decimated the ranks of the Ichiki Detachment. The location was initially referred to as the Tenaru River due to a mislabeled map. The answer, as the balance of the war proved prophetically true, was combat with no quarter. And the actions of soldiers under Ichiki’s command offer a glimpse into the mind of Lance Corporal Kiyoshi Koto, who also refused to surrender when he found himself in a losing battle, wrote his farewell letter home, and in the last days of November 1942 went forward to fight and die. He had no illusions about his future. Instead, his thoughts were with home and with his brothers in arms along with a final hope that he could save his family the pain of not knowing what had happened to him. Lance Corporal Koto was hungry and wounded, but it is unlikely that he was troubled by his hunger or his pain as he reached the front on the day he had written his letter. Koto was killed in action about midnight on the same day, and his letter was never delivered. Instead, an American soldier pulled the letter from Koto’s uniform pocket and took it to his intelligence officer. The letter was translated into English while a few of Koto’s captured countrymen dug a grave for him somewhere on Guadalcanal, and the short paragraphs that Koto had hoped would give his family a sense of closure instead became a source of information and a curiosity for his American enemy. Every Japanese sailor and soldier was familiar with the Song of the Warrior, an ancient ballad that captured the centuries of fighting culture that made surrender unthinkable for Kiyoshi Koto. Thus for the sake of the Emperor, I shall not die peacefully at home. After the war, the Japanese returned to Guadalcanal to reclaim their dead. Americans, their former enemies, were among those who helped the Japanese locate the graves of their countrymen, and perhaps Lance Corporal Kiyoshi Koto was among those whose remains were finally taken home. Author Phil Scearce has conducted extensive research on World War II in the Pacific. He resides in Murfreesboro, Tennessee. Tags American, artillery, Australia, Battle of Midway, Battle of the Tenaru, British, Brothers in Arms, cod, duty calls, GRU, Guadalcanal, Guam, Hand Grenade, Henderson Field, Ilu River, Japan, Japanese, Kiyono Ichiki, lance, LCA, machine gun, Marines, Maru, military, military history, navy, New Guinea, OSS, Pacific, Pacific War, Paris, Port Moresby, POW, Solomon Islands, Squad, sword, Tanks, Tenaru River, Tern, The Pacific, Thor, Tory, United States, US Army, weapons, WIN, World War I, wounded.